The Division of Vascular and Interventional Radiology (IR) uses state-of-the-art minimally invasive techniques and imaging-guidance to replace conventional surgery. IR radiologists are involved in the treatment of patients as well as the diagnosis of disease, providing a full array of patient care for the chest, abdomen, and extremities. Services include diagnostic arteriography, renal and peripheral vascular interventions, biliary, thoracic and abdominal stent grafts, venous access procedures, and embolization cancer therapies to name a few. More than 6,000 cases are performed yearly. The IR Clinic provides patient evaluations and referral follow-ups, with special emphasis on regional therapy of liver malignancies, uterine fibroid embolization, and varicose vein treatment. With the use of catheters, various x-ray, and imaging techniques using CT, MRI, and Ultrasound scanner machines, IR offers an alternative to surgical treatment and can eliminate the need for hospitalization in certain cases. Our division is actively engaged in basic and translational research as well as clinical trial research—all designed to advance innovations in minimally invasive, image-guided therapies and further scientific knowledge in the field. This is an annual symposium hosted by the UVA Radiology Department that provides students with an overview of the imaging, anatomy, pathology and treatments pertinent to Interventional Radiology. 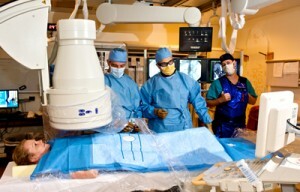 Participants will have an opportunity to get hands-on simulation experience, with exposure to several devices and techniques used in minimally invasive procedures. We are committed to raising awareness of peripheral arterial disease (PAD), a condition that increases the risk for stroke, heart attack, and loss of limbs. Our “Legs for Life” program offers screening for those considered at risk for PAD and provides advice to patients about the most practical and effective treatment options available. The Division of Vascular and Interventional Radiology offers an ACGME-accredited fellowship in Angiography and Interventional Radiology to candidates who have completed an ACGME-accredited residency in diagnostic radiology more information. Also offered is “The Clinical Pathway for Vascular and Interventional Radiology Training,” a program providing a broader and more in-depth experience in the clinical diagnosis and care of patients with diseases commonly treated by IR.